Hands on experience with one of the famous Carl Zeiss Jena family member. 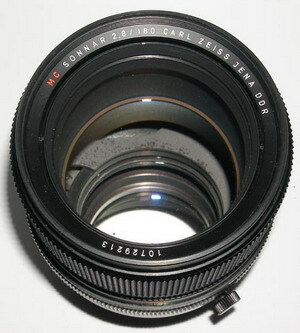 My first Sonnar was Carl Zeiss Jena 200mm f/2.8 MC M42 lens, before this lens I couldn't make any photo with "feeling". I just made photos like a tourist, nothing special. When I saw the result how different with this beautiful master piece, I decided I will try and purchase many as I can. Today I get my Carl Zeiss Jena Sonnar 180mm f/2.8 MC lens, perhaps more good looking than Sonnar 200 and probably less heavy. Very easy to focusing and set the aperture ring, I enjoy really this lens on my Nikon D50 body. Nikon D50 has nice feature it has auto focus feedback with manual lenses too. This feature disabled in Canon EOS 350D and in Olympus 500 and probably in other cameras too. After 15 minutes walking and shooting my left arm getting tired to keep this big glass, so this is definetly not a traveler lens. You can make very sharp photos with lovely colors and nice creamy bookeh. Ideal to make artistic photos and probably for portraits, but I didn't tested yet on people. Compare with other variant of Sonnars same sharp as 135 mm version excellent quality, but I like better my very old Olympic Sonnars. I have the late MC version of the 2.8/180mm CZJ Sonnar. It is a wonderful lens. Great for portraits. I have an adapter to use it on a m42 35mm camera. I use it on my 35mm camera for sports. It is one of the sharpest lenses I own. The results are very fine. I recommend the lens and give it five stars. The lens I have is the very latest model of the CJZ 180 sonnar: all black MC with the switch on back. It is in immaculate condition. Simply put, it is one of the finest lenses I have ever owned. It is mechanically excellent, and images from it are beautiful. The price is incredibly low. The bokeh is beautiful, the image is very sharp, and the lens is fast. What more could you ask for? Perhaps a little less weight, but you can't have everything. What model of converter adapter you use for this lens with Nikon? I also have this beast of lens in MC, wonderful on my E420, extremly sharp and the colors are sooooooooo natural, go out and get one similar from other Manufactures, you least pay $3.000,00 when you are lucky,LOL. You need to search on Ebay and look Pentacon Six or P6 EOS adapter it is available from many China or HK based seller. I've had one of these lens in an old box for years and never used it would you believe. Having recently bought a Canon 5D M2 I'm wondering if I could get a mount converter that will allow me to use it. Do you know if one exists and if so, where I might locate one?